Now it's finally time. 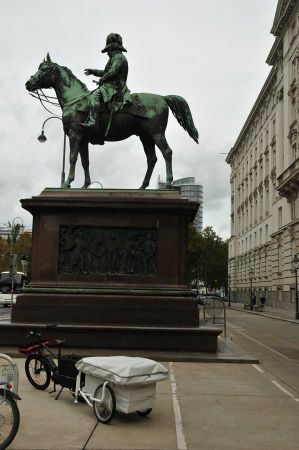 In Vienna, the first B TURTLE rental station directly starts from the company headquarters - in Vienna's Murlingengasse 44 in Vienna's 12th district. The location itself offers, due to the cycling path directly in front of the office door, the entry into the wonderfully developed cycle path network of the city of Vienna is possible, and thus a direct connection to the Danube cycle path. 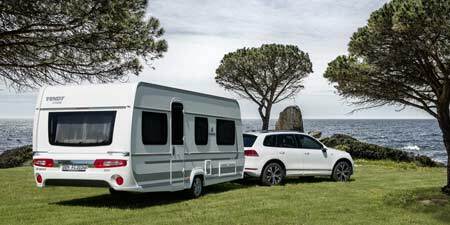 BT VOYAGE: Just rent a B TURTLE! GentleTent is working hard to set up an international network of lending stations created with the project name BT VOYAGE. On as many bike routes as possible it should be possible to book a B TURTLE for a TURTLE trip. 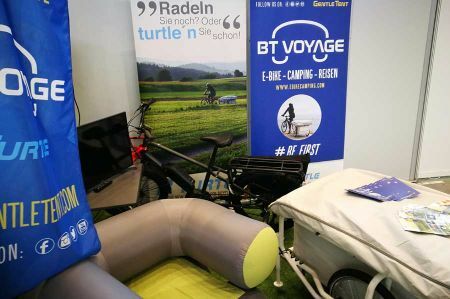 For the time now, there are just possibilities in Vienna, in Switzerland, in Germany, France and in Denmark for renting Bturtle, there are already more partners who set up a B TURTLE rental offer and will start with BT VOYAGE with the new season 2019. We too, along with other "test pilots", were invited to a test and exploration tour to Murlingengasse in Vienna by CEO Gernot Rammer, where in addition to the B TURTLE, a brand new "Benno" multifunctional E-bike was ready for testing. The Benno Bike in combination with the B TURTLE offers a huge storage space. Large panniers on the rear luggage rack mounted, just like a load carrier on the front of the bike (enough space as a seat for the four-legged companion), a lot of travel luggage can be stowed so rainproof, in addition there is the entire cargo area of ​​the mini-caravan. Storage space enough for multi-day tours. The Benno bike is equipped with Bosch's four-stage assistance engine (Eco, Tour, Sport and Turbo), which according to the manufacturer will allow 80 to 120 kilometers of bike ride, depending on the terrain and the weight to be supported. Important here, you have to cycle to get support from the electric motor because when reaching 25 km / h the engine shuts off. There is also the possibility of supporting the electric motor while walking, which should prove to be a great help later on when a bridge had to be climbed. Incidentally, the connection between e-bike and B TURTLE is made by the long-proven Weber coupling, whose axle joint is mounted on the rear bicycle axle and bolted. In the case of the Benno bike, just a slightly longer axle bolt had to be used. Important for guests who would like to set out on their own bike to explore. The coupling axle of the B TURTLE is then inserted by turning on the attached to the wheel coupling and the team is ready to go. Of course, we also wanted to test the actual range, which is why we always initially set to the driving level Eco, ie the smallest support, which allowed even about 21 km / h as the average speed without much effort. Quickly packed some provisions, plus a rain jacket (for safety, unfortunately, in the cloudy trial day) and the test tour could begin, first destination the campsite New Danube on the Danube Island. First, along the Wilhelmsdorfer Park in the Längenfeldgasse, it was mainly slightly downhill to the Vienna River. If not completely separate bike paths are available, there are at least cycling tracks on almost all roads, so that despite the high traffic safe driving through the city is possible. Along the Wien River, combined pedestrian cycle paths lead into the city center. Our destination is Karlsplatz. 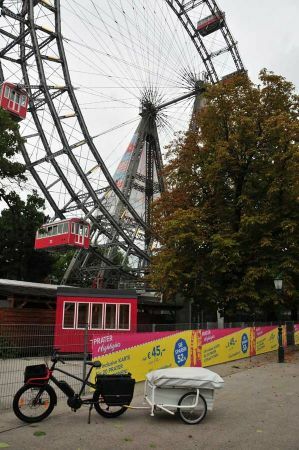 Then, crossing the city park, we reached the Danube Canal next the Hundertwasserhaus, then continue to the Prater, of course with a mandatory photo in front of the famous Ferris wheel. The parkland continues to the Ernst Happel football stadium, where the sports clubs of Vienna were organizing an open day for their individual sports clubs. We have reached the bank of the Danube and cross it below the motorway bridge of the A 23, equipped on both sides with passable wheel lifts, where we changed the driving level of the engine control from Eco to Sport for the first time to get more propulsion support. A part of the Danube Cycle Path running along here, crossing over to the campsite Neue Donau, which offers itself as an overnight camping site on the Danube Cycle Path and also for Vienna exploration. Back to the Danube we follow the cycle path along the river through Lobau with its huge oil facilities, then arrive in the National Park Donau Auen. Opposite the ancient Roman city of Carnuntum, we cross the Danube river, driving along quite sandy dirt roads, where we can gratefully test the off-road capability of the bike and BTURTLE for the rather grippy tires. The result is more than satisfactory. Neither gravel nor deep sand could limit the tour. After a short break and the encounter with a grass snake, we went back to Vienna to campsite Wien West, where we prepare the B TURTLE for the night. We completed a beautiful day tour of 62 kilometers and hit many famous and unknown places in Vienna. The battery still shows 25% state of charge, so probably another 20 kilometers would have been possible despite the trailer load B Turtle. The night has cooled down a lot. But thanks to very good sleeping bags we had a restful and comfortable sleep in our trailer tent. As we have already had been warned by GentleTent, a group of volunteers gathered around our micro caravan. So we were able to add on our first travel experiences right away. After a short breakfast we started the return journey to the Murlingengasse. For us it was a great, eventful trip. We knew we would be heading to a campsite with infrastructure. But we always had the feeling that we could just stop if necessary. With the B TURTLE a sense of freedom of travel actually arises ... We look forward to the next exit with the TURTLE. And when do you want to go for a trial tour?